One of my favorite blogging ladies, Jenna at je na sais quoi, does this series called SBQL. She posts a song, a book, a quote and a look to usher in the weekend. I'm playing along because it's such a good look into what is piquing my interest right now. song | no shame in my game, but i've been obsessed with katy perry's new album prism this week. specifically i'm in love with "it takes two." preach, katy. preach. 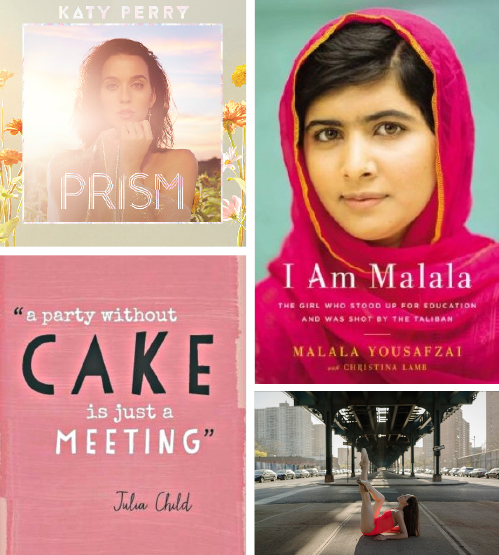 book | i'm anxious to start digging into "i am malala: the girl who stood up for education and was shot by the taliban ." though women's issues have been on the forefront of my mind a lot in the past, working at a women's college has only made it more prevalent in my life. malala is an amazing girl, and she will grow into an amazing woman. quote | well i mean who wants to go to a party without cake? not i, my friend. quote found here. look | i just can't get enough of the ballerina project. it just constantly amazes me, the things people can do with their bodies. someone make me that graceful please. it's also fitting that this is my favorite look of the week since i'm a ballerina for halloween this year. you can find that exact picture here. I hope you all have a marvelous weekend. Enjoy each and every moment. What a fun idea! Love everything- and checking out the book right now.